Kathryn O'Halloran, Headware for Night, Headware for Clean Air, and Headware for Day. Installation view Harmony Murphy Gallery. Kathryn O'Halloran, Sound Bowls , Sound and Light Bowl , and Sound and Light Bowl. Installation view Harmony Murphy Gallery. Kathryn O'Halloran, Thinking Chair, Self-reflection and Growth Tower, and My Childhood Bed Tent (a hand-me-down from my brother). Installation view Harmony Murphy Gallery. 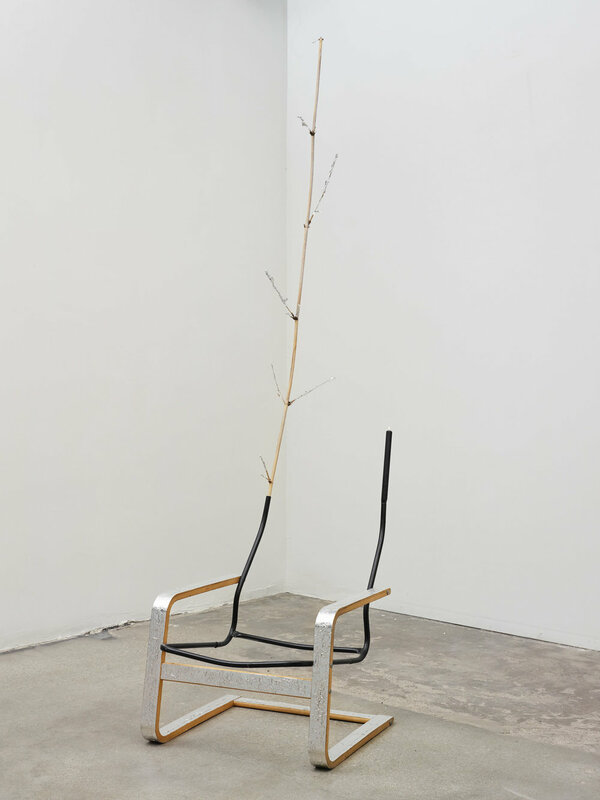 Kathryn O'Halloran, Thinking Chair, 2017. Chair, bamboo, aluminum leaf, candle, and aluminum tape. 104 x 40 x 25.25 inches. 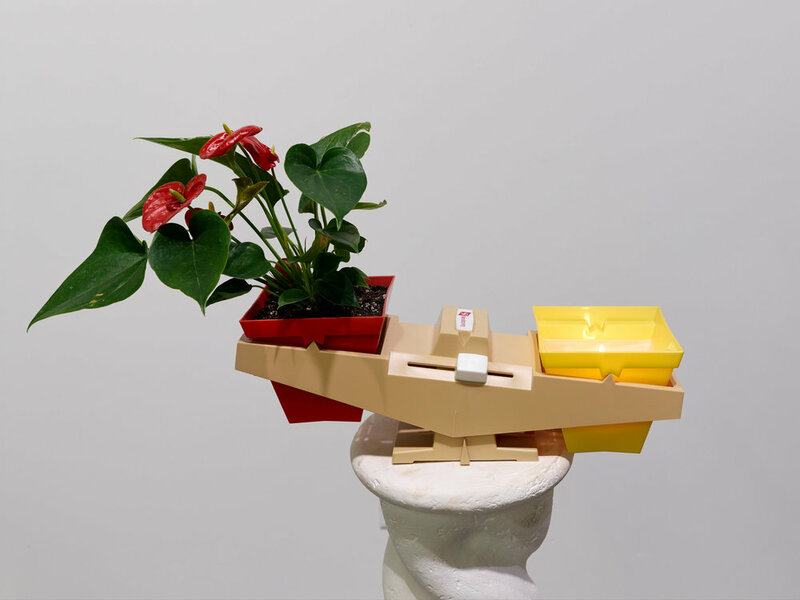 Kathryn O Halloran, Self-reflection and Growth Tower, 2017. Mirror, plant, PVC pipe, aluminium foil, and terry cloth cushion. 104 x 24 x 24 inches. Kathryn O Halloran, Self-reflection and Growth Tower (detail), 2017. Mirror, plant, PVC pipe, aluminium foil, and terry cloth cushion. 104 x 24 x 24 inches. Kathryn O'Halloran, Retainer Wreath, 2017. My retainer from childhood and aluminum wire. 27 x 11.5 x 3.25 inches. Installation view Kathryn O’Halloran Electric Longings, Harmony Murphy Gallery. 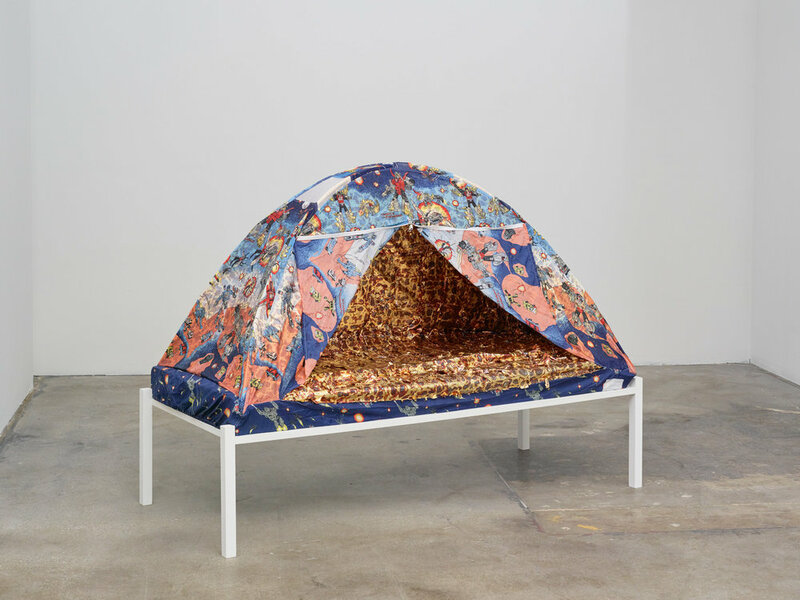 Kathryn O'Halloran, My Childhood Bed Tent (a hand-me-down from my brother), 2017. Bed tent, variegated gold leaf, wood frame, and foam mattress. 53.5 x 74 x 32 inches. Kathryn O'Halloran, Clock, 2017. Scale, wax, wick, plant, and plaster plinth. 58 x 22 x 11 inches. Kathryn O'Halloran, Clock (detail), 2017. Scale, wax, wick, plant, and plaster plinth. 58 x 22 x 11 inches. 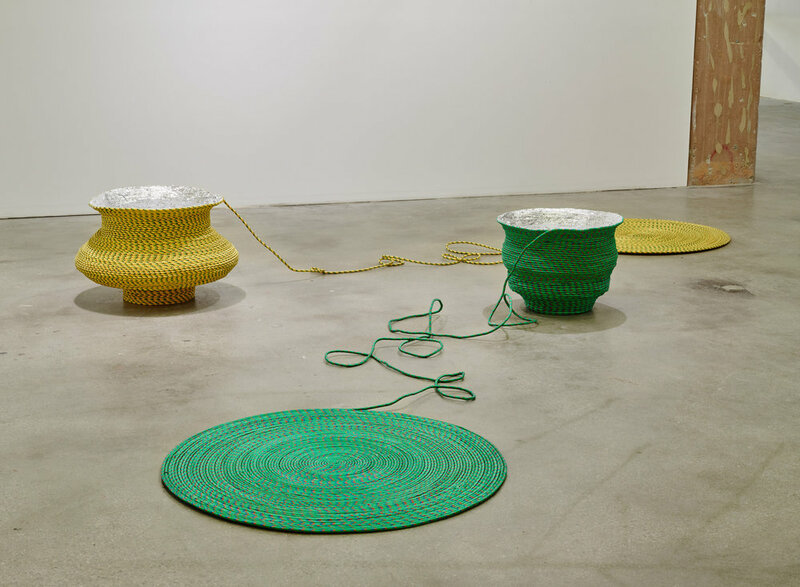 Kathryn O'Halloran, Focus and Gather Stations (for the sun), 2017. Utility rope, glue, aluminum leaf, and bamboo. Dimensions variable. 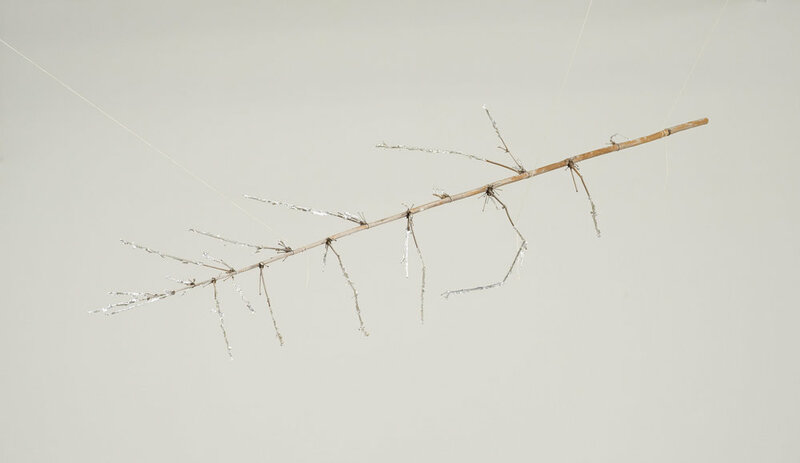 Kathryn O'Halloran, Focus and Gather Stations (for the sun) (detail), 2017. Utility rope, glue, aluminum leaf, and bamboo. Dimensions variable. Kathryn O'Halloran, Flashlight Sconce, 2017. Flashlight and fresh cut flowers. 13.5 x 5 x 3.25 inches. The theme of self-activated protection is also found in such works as Headware for Day, Headware for Night, and Headware for Clean Air (2017). In this series of sculptures, a trio of mannequin heads are outfitted in protective gear devised as garments that enable the wearer to reveal as much or as little of themselves as they desire. She ruminates on the dichotomy of exposure and secrecy, fullness and emptiness. 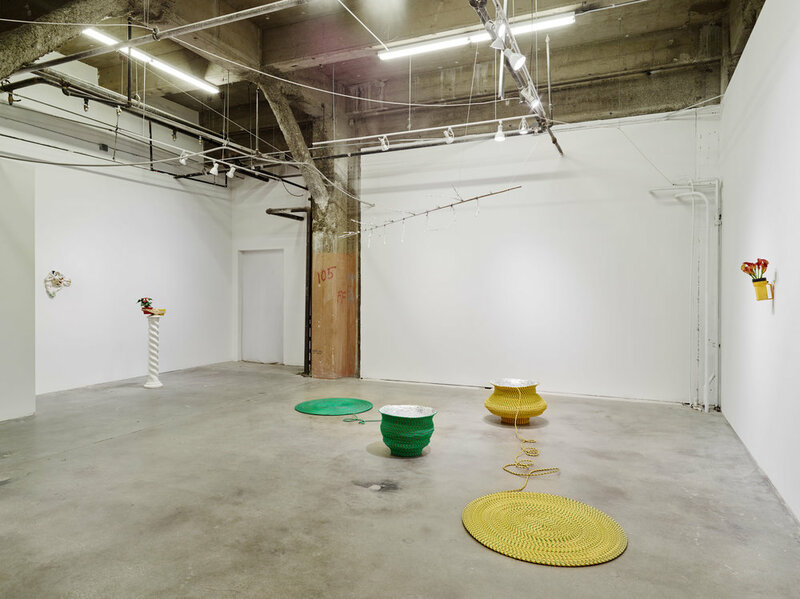 O’Halloran reminds us, through works such as Sound Bowls, 2017, that what can appear at first glance to be devoid of substance can instead be inhabited by a natural essence. 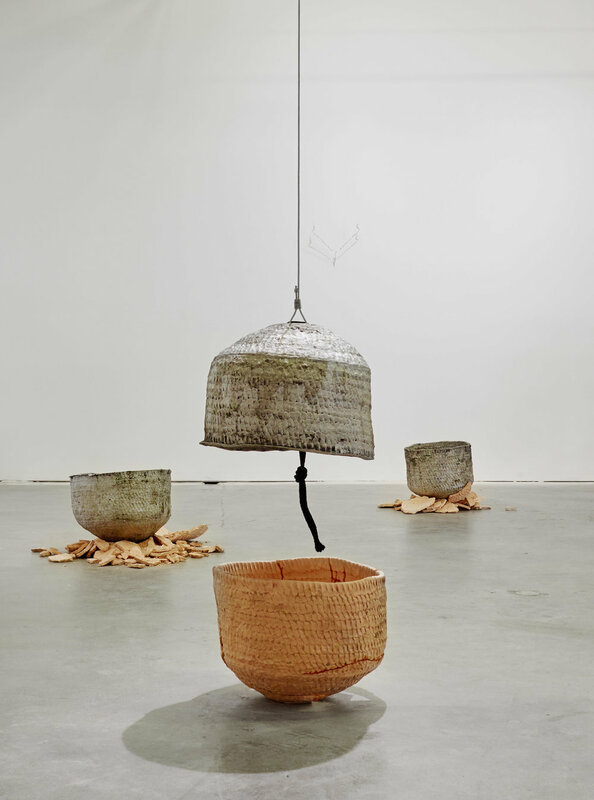 These ceramic and aluminum vessels have been broken and re-cast as bells to create sound or reconstituted as air-filled containers. The ability to identify absence as presence is a key factor in nurture and optimism; finding strength in re-assembly and tangibility in constants such as light or sound. Electric longing purports that preserving memory and experience is an aspect of self-care and that the props that dressed our personal histories have enormous influence over our future feelings of comfort and safety.